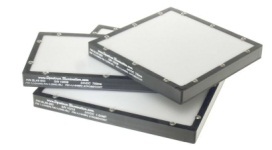 This is a quality 6" x 6" backlight manufactured by Spectrum Illumination. It is typically used to image objects in silhouette for measurement applications and feature presence detection. It can also be used as a low-intensity diffuse front light. The light includes a white diffuser, quick-disconnect connector, and a 4 meter cable as standard. This white light should only be operated in strobed mode for full LED life.